Australia’s Shakira Westdorp was the best all-round athlete at the ISA Worlds in Nicaragua. No question. An amazing performance, where she scored four medals across both surfing and racing, showed just how strong this humble paddler is and what could be in store if Shak ever wanted to take racing seriously. Her preparation for the 2014 ISA Worlds was hardly perfect. After a few of the top women in Australia withdrew from the racing for various reasons, Shak was called on at the last minute to help out the nation. She was always going to be in Nicaragua for the SUP surfing, but suddenly the team bosses were asking her to back that up and do the long distance, short course and team relay races as well. With just three weeks of serious race training (punctuated by a car crash the week before the event), you couldn’t have blamed some (i.e. me) for wrongly predicting Shak not to take a gold in the racing. 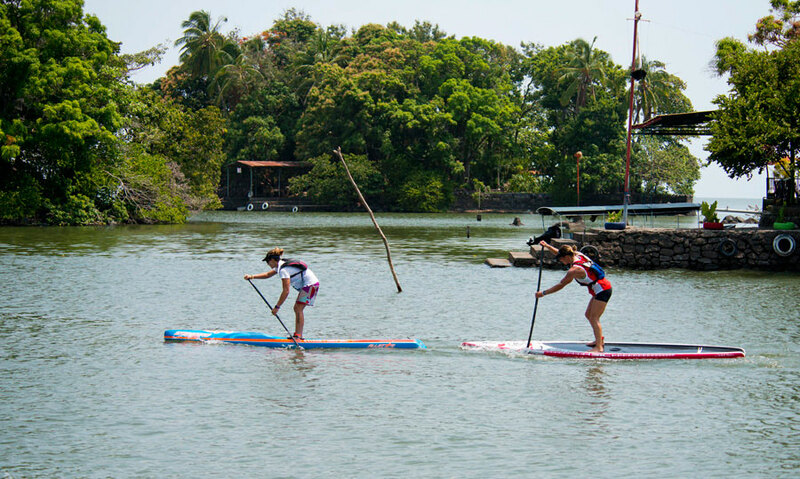 It wasn’t only that she hardly prepared… or that she was up against the likes of Lina Augaitis and Jenny Kalmbach… or that the racing was held on a Lake miles away from Shakira’s preferred ocean setting… it was also that Shak had to compete more times than virtually any other paddler in Nicaragua. 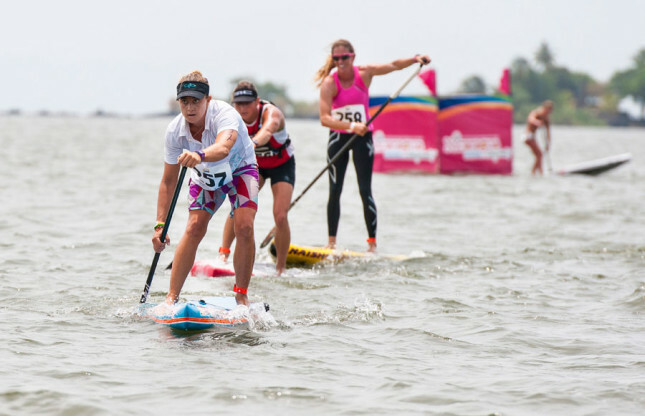 After three full days and countless heats of SUP surfing, where she made it right through to the final (and was unlucky not to get a silver – she took bronze), Shak had just one day to rest before four solid days of racing on a 37 degree (100′ F) Lake. But with the odds stacked against her Shakira seemed to excel. She looked very strong in the distance race, sitting in 1st or 2nd the entire race before the hot favourite Lina Augaitis of Canada pulled away near the death. Most predicted Lina would make it double gold in the course race, or that perhaps Jenny Kalmbach would claim one for Costa Rica, but to the delights of Team Australia (and the complete surprise of Shak herself), the Aussie pulled away in the closing stages of the short course final to claim a memorable win. Lina is one of the fastest flat water paddlers in the world right now, while Jenny is a machine in these kind of course races. Yet Shak managed to pull away from both of them in the closing stages. In the form she showed on the weekend, Shak would be a contender no matter what the conditions. But throw in the potential for some serious waves at the new Battle of the Paddle venue Salt Creek and suddenly the Aussie would have a legit chance of repeating her BOP victory. That’s right, repeat her BOP victory. For those new to the SUP racing scene, Shakira Westdorp isn’t a familiar name. 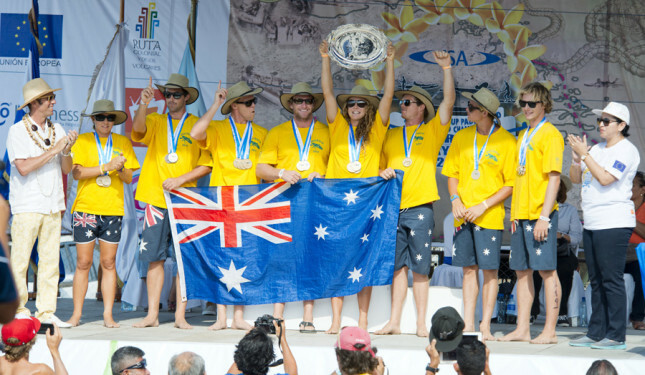 However for those who remember the “old days” (yes, four years counts as “old” in the young world of SUP racing), Shak was one of the originals, winning the second ever Battle of the Paddle way back in 2009 (a golden year for the Aussies with Jamie Mitchell winning the men’s). Despite not having taken racing seriously in the past three or four years, Shak clearly has a very solid base to build from. So even with just a few months training under her belt, I reckon she’d be a good chance at the BOP Elite Race this year. However the Starboard rider will need to find the motivation first: SUP surfing is clearly what drives this supreme Aussie talent, while racing is merely an afterthought. I asked Shak on Friday, after an unexpected silver medal in the distance race, whether she’d make a comeback. At that point it seemed only a small chance of happening, however just 48 hours later, after an amazing race landed her a gold medal in the short course, those odds had improved to 50/50. At age 29, Shak has plenty of years left. Her friend and fellow flag bearer for being a true blue Aussie, Kelly Margetts, is a fixture on the BOP podium at age 41. Not only a uber-talented, all-round paddler, Shak is also one of the easiest people in the world to get along with. She’s humble, friendly, always up for a beer and doesn’t mind taking the piss (about herself or her team mates). So I hope Shak is flying the flag for Australia again in California come October. With the likes of Karla Gilbert (3rd in the 2013 BOP Elite Race), Terrene Black (defending Molokai champ and 4th at the 2013 BOP), Angie Jackson (looking fitter and stronger than ever) and Sondra Purser (top 10 at three of the last four BOPs) also flying the Green & Gold, the Aussies could have a very formidable lineup on the women’s side this year.